I left my house just as the sun was beginning to rise above the horizon. It was cold still, only about 29, but the sky was clear and the forecast was for the temperatures to rise into the low 60s by mid afternoon. As I drove the 1.5 hour drive west I saw the moon – now just past full – in the sky above me. I chased it until it faded from view as the sun rose higher and it began to set. I arrived at the trailhead on Switzer Hill Road a little before 8am. After changing into my boots and pulling on my pack I started out on the trail heading west (mile 0.0 – 7:58 am). The first leg of the trail was a short one, only 0.6 miles according to my map. 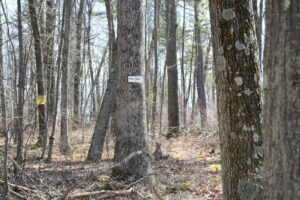 About half way between Switzer Hill Road and Goundry Hill Road I entered a section of tall red pine trees. 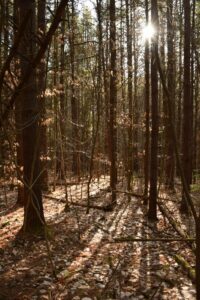 The sun, still low in the sky, shone through the trees casting long shadows on the ground. Soon after passing through the pine trees I arrived at Goundry Hill Road and crossed (mile 0.5 – 8:15 am). I descended to a small stream and then began to climb back up. 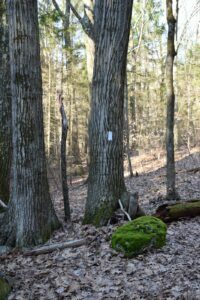 As I climbed I came upon a moss-covered rock next to a tree with the white blaze of the FLT on it. The bright green contrasted against the muted browns and grays of the woods. I continued on after taking a picture and came upon a sign posted on a tree. It explained how volunteers from the FLTC had rebuilt and rerouted the trail ahead through a series of switchbacks in the summer of 2005. I climbed a small set of switchbacks up to Guernin Road (mile 1.4 – 8:40 am); even eleven years later the trail was still in good condition. Guernin Road had wide shoulders and the sunlight beamed down on me in the open spaces. It felt warm and I thought about removing my long-sleeved shirt, but it was still chilly in the shade. I decided to keep the long-sleeved shirt on for now and I continued across Guernin Road. The trail took me down a bigger series of switchbacks after leaving Guernin Road. I was glad for the switchbacks because the slope of the hill was quite steep in places. After descending several hundred feet on the switchbacks the trail began to slow its descent and turned to follow a small stream. The trail continued to follow the stream until I arrived at Corbett Hollow Road (mile 2.9 – 9:15 am), which could barely be considered a road. The trail opened out on a turnaround loop of the “road” and then followed it south before turning off to the right. 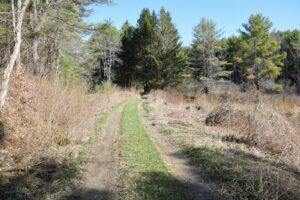 I left Corbett Hollow Road and the trail turned back in the direction I had just come from following yet another small stream. I decided it was a good time to take a break and found a rock in the sunlight to sit on (mile 3.1 – 9:24 am). After a bottle of water and a granola bar I pulled my pack back onto my shoulders and continued on. 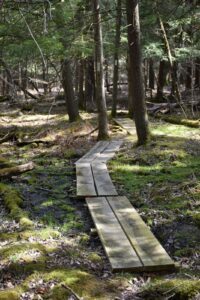 The FLT is an ever changing trail; sections are re-routed due to many different reasons. On previous hikes I have found sections that are now closed, the old white blazes are painted over with gray and sometimes signs are posted to inform the hikers of the change. As I neared Monterey Road I found one such section with a small “trail closed” sign (mile 4.7 – 10:12 am). I could just barely make out the old section of the trail. 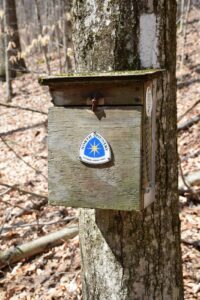 I arrived at Monterey Road (also called Sexton Hollow Road) and crossed over (mile 5.2 – 10:25 am). The trail then ran parallel to the road, but below it. I grumbled under my breath at the garbage that had been tossed from the road. On rural roads such as this one you often find that people have thrown garbage over the side of the road. The trail turned away from the road and descended to cross a stream. After crossing the stream the trail began to climb and soon after I found a trail register (mile 5.7 – 10:45 am). I stopped to sign the register and I flipped through to see if there were any witty or interesting remarks, sadly all the ones I read were standard fare. I again thought about taking my long-sleeved shirt off, but decided it was still just cool enough in the shade to keep it on. The trail climbed up to Dennis Road (mile 6.5 – 11:09 am) along some logging roads. 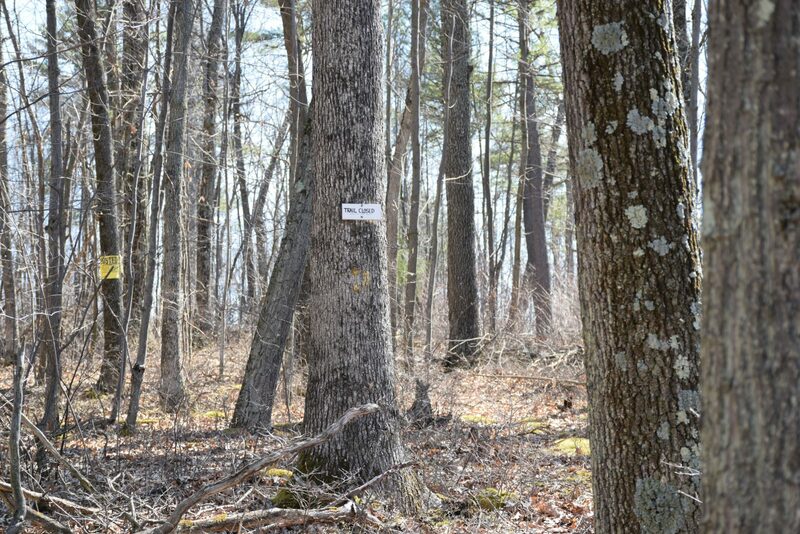 At one point as I walked along the logging road I was lost in thought, I looked up and could not find a white blaze. I thought I may have missed a turn, so I backtracked. I found a blaze not far back and realized that I was still on the right path, the trail just was not blazed well. As I approached Dennis Road I was glad I had kept the long-sleeved shirt on; a bank of clouds had rolled in and the wind had picked up making it feel quite chilly. The final leg of the trail left Dennis Road and wound south around Moss Hill before heading back north to Moss Hill Road and CR 17. This section was a long one, 2.8 miles. At about the mid-point the Crystal Hills trail begins (or ends depending on which way you were hiking). The Crystal Hills trail runs south to the Pennsylvania border before joining with the Great Eastern Trail which runs south to Mississippi, although it is not fully complete yet. It also happens to run past the house that I grew up in. Perhaps someday I will come back and hike down the Crystal Hills trail, but that is for another day. I continued on past the Crystal Hills trail and headed north as the trail climbed (mile 7.7 – 11:48 am). At times it followed an old road that was now becoming overgrown. 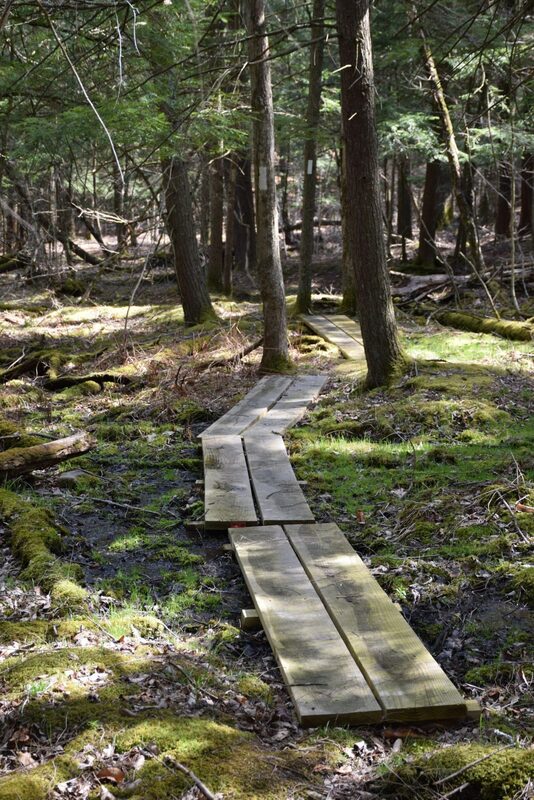 The trail would join the old road and then leave it to go around washouts and waterlogged areas. The clouds had begun to move off and the sun came back out making it feel warm again. One final time the trail joined the old road and climbed past a locked gate and then onto Moss Hill Road. I walked a short distance up the paved road to the intersection of CR 17; I had reached my turnaround (mile 9.4 – 12:31 pm). I took a few pictures and then headed back down the road. It was now afternoon and I planned to stop for lunch back at the intersection of the Crystal Hills trail; Moss Hill Lean-to was there and it would offer a nice lunch spot. I moved along at a good pace and was soon at the lean-to (mile 11.2 – 1:19 pm). I dropped my pack beside the picnic table and unlaced my boots and took them off. It felt good to give my feet a rest. I ate my lunch and enjoyed the warm sun. There were two small streams nearby and the sound of the water rippling over the rocks was very soothing. 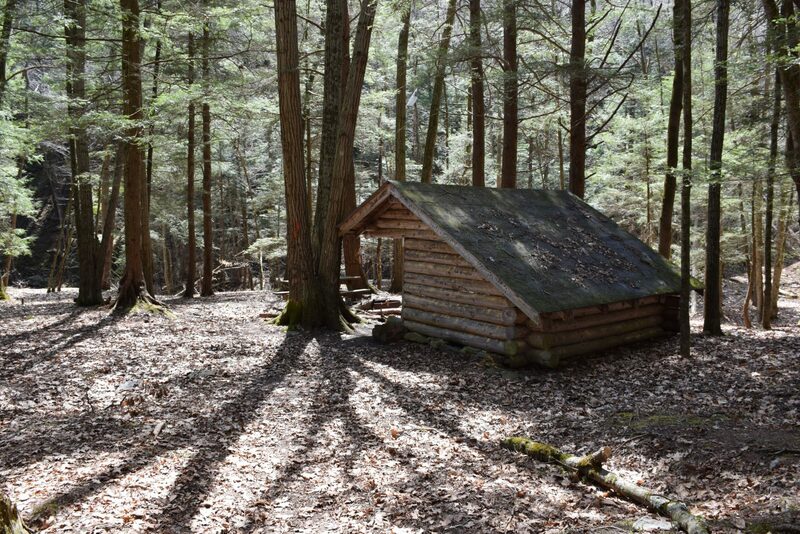 I could imagine camping at the lean-to and falling asleep quite quickly to the soothing sound. After a rest I took a few pictures and then reluctantly pulled my boots back on. I decided that it was time to take the long-sleeved shirt off, so I pulled it off and tied it on a loop on my pack. Then I pulled the pack on and said goodbye to the lean-to. The trail climbed and crossed Dennis Road (mile 12.7 – 2:23 pm). This time there were no clouds and the sun was bright and warm. I crossed over and headed back down the hill following the logging roads. This time I did not have to second guess the trail. I stopped at the trail register again to sign in on my way back and then continued on down across a small stream and back up to follow alongside Monterey Road (mile 13.9 – 2:58 pm). I crossed over and continued my climb to the top of the hill and then back down toward Corbett Hollow Road. 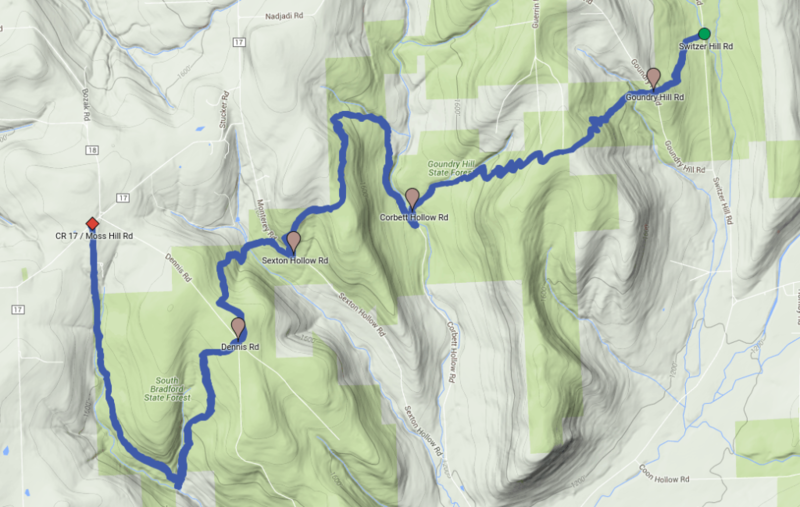 As I got closer to Corbett Hollow Road I walked across a number of spans over wet ground (mile 15.5 – 3:47 pm). I had passed over them on the way out, but had not stopped to take a picture. This time I decided to stop. After a few pictures I continued on and soon followed the stream near Corbett Hollow Road and then past the rock I had rested on earlier; it was now in shade. I left Corbett Hollow Road and decided to take a short rest break (mile 16.2 – 4:06 pm) I had about three miles left and a climb ahead of me up the switchbacks; although they made the climb easier I was getting tired and my feet and shoulders were sore. A rest, some water and a banana would be a good idea. After the short rest I started out again and climbed up through the switchbacks to the top of the hill. It was beginning to get a little chilly again; some clouds had once again started to move in, so I pulled my long-sleeved shirt back on. The trail crossed over Duernin Road and then back down the smaller set of switchbacks before crossing a stream and making a short climb up to Goundry Hill Road (mile 18.5 – 5:21 pm). I was almost there, less than a mile to go; I was tired and sore. I pressed on, all of the climbs behind me and just a gentle downhill ahead. I kept checking my GPS and zooming in as I got closer and closer to Switzer Hill Road. Finally I could see the road and my car ahead. Seconds later the trail opened out onto the road (mile 19.1 – 5:37 pm). I headed for my car, dropped my pack, and happily traded my boots for sandals. The first hike of the season was now complete. I had a 1.5 hour drive ahead of me, but at the end a hot shower and hot meal.